Type of path: coastal path with steep sections with steps and tunnels. Route description: a particularly rough path that goes around the coast to Calella. Points of interest: les Aigües Mortes, el Castellet d’en Niell, els Forcats point, la Roca Vermella, la Font d’en Roques Cove, la Font d’en Fina Cove, l’Agulla del Golfet, cap Roig, Cap Roig botanical gardens. 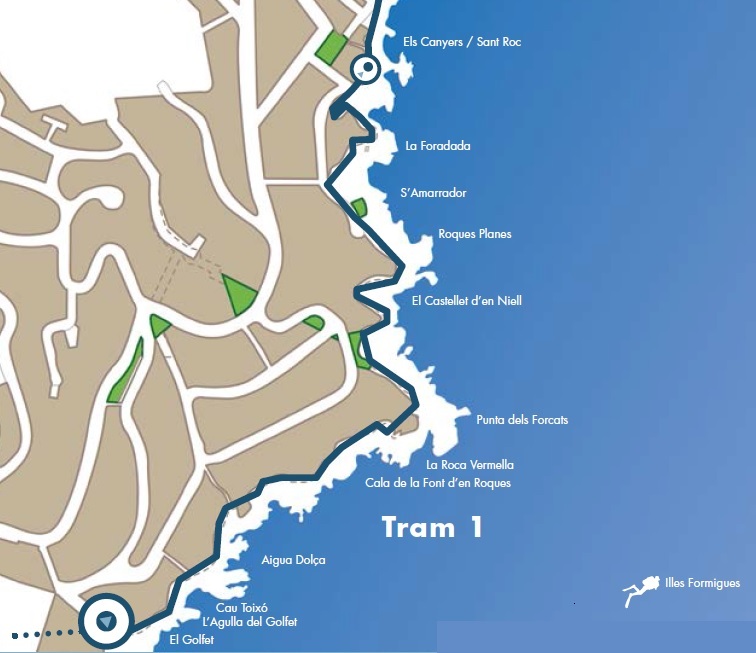 The particularly rough section from el Golfet to Sant Roc can be started alongside the Sant Roc hotel, where there are some steps leading to the camí de ronda coastal path. The stroll gives a spectacular view of Calella seafront, and goes around the coast with the help of steps and tunnels to give a nearby view of the Illes Formigues where a naval battle was held in 1285 which destroyed the fleet of Felip III, otherwise known as l’Ardit, and to reveal the Mediterranean vegetation and hear the birds singing… We will also find interesting rocky outcrops such as el Castellet d’en Niell, la punta dels Forcats, l’Agulla del Golfet… before finally reaching el Golfet beach (if we leave the white and red markings of the GR-92 which continue down some long steps to our right and go straight on). To enjoy an air view of this beach, we can follow the GR-92 markings to Dorothy Webster Square. 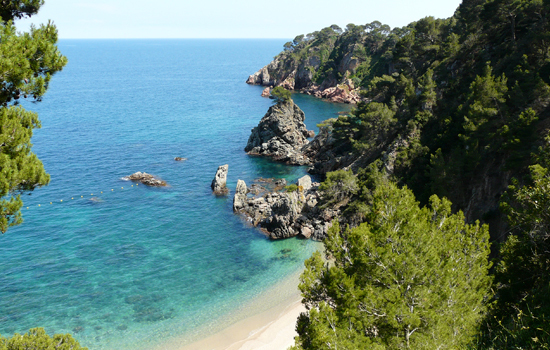 This section gives us an idea of what the Costa Brava is really like. Once at el Golfet beach, we can continue along the GR-92 to Cap Roig, where we come to the botanical gardens with their Mediterranean flora. After this the path continues towards Palamós or we can go back on ourselves and return to the district of Sant Roc. Recommendations: follow the white and red markings of the GR-92, do not walk the path in stormy weather, wear comfortable footwear and take water with you.